(a superb article first posted two years ago) If you are reading this in the year 2061, I hope that the spirit of entrepreneurship is still alive and vibrant in America. I hope that the “can do” dynamic that defined our earlier years as a nation can still lead dreamers to pursue their passion despite the seemingly insurmountable odds against success. On that hope hangs today’s tale. Inventor, tinkerer, tycoon – all of these labels easily attach themselves to Powel Crosley, the founder of the car that is the focus of our story. That his eponymous car failed in the market is indisputable. 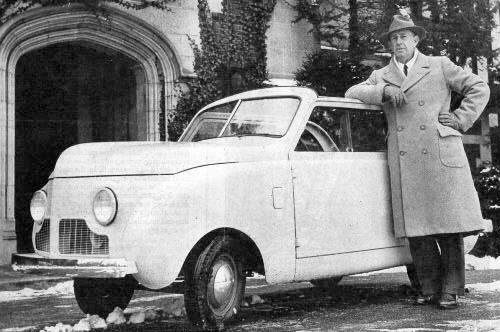 After just eleven model years, the Crosley disappeared and was soon rendered a footnote in automotive history. But while it lasted, the car gave the buying public a real, if unorthodox, choice in basic, subcompact transportation. 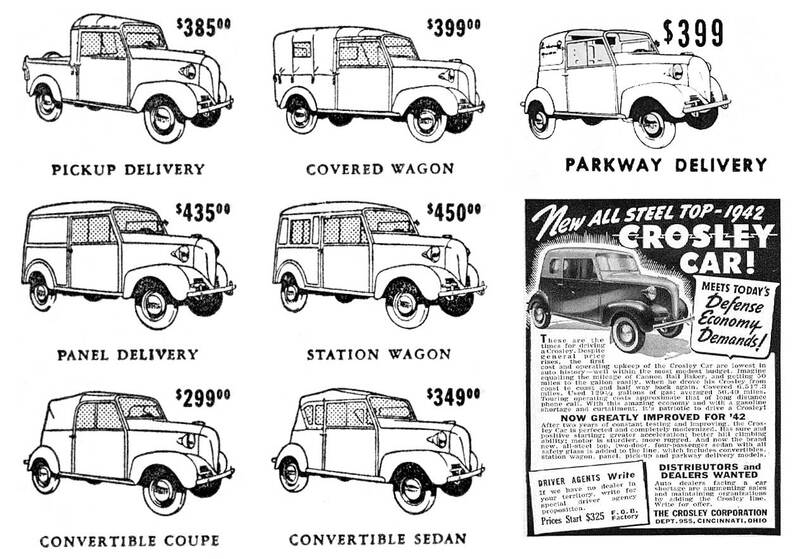 Powel Crosley had already made a couple of fortunes in pre-war America before he got into the auto business. In the early 1920’s, at a time when a decent home radio cost about a hundred dollars, the young Crosley figured out a way to build and sell a quality set for twenty. Sales took off like a rocket and assembly lines in Cincinnati worked day and night to satiate demand. 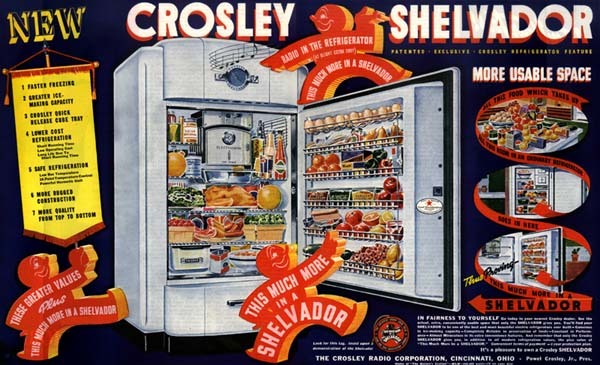 Later, when evolving family work and leisure habits changed home refrigeration from luxury to near necessity, Crosley caught lightning again with his company’s “Shelvador” line of high quality, low cost refrigerators. The Shelvador raked in profits that made Crosley one of America’s wealthiest men during the great depression. Crosley used the money earned from appliances to diversify into broadcasting, farming and even major league baseball. But for all of his interests, Crosley harbored a lifelong passion to build a low priced, simple and reliable automobile. As the depression ground on through the 1930’s, he began to formulate the basic concepts that would result in a working prototype by 1937. 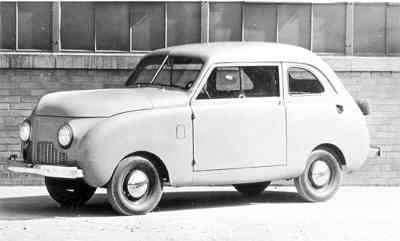 The so called CRAD (Crosley Radio Auto Division) prototype was downright weird, with a rear track only a foot and a half wide and an 80 inch wheelbase. Clearly, a more mainstream offering would have to be developed. When pictures were leaked of the oddball car, the reaction was immediate and unforgiving. Cooler heads prevailed and the final version of the first production cars were announced with an identical front and rear width. 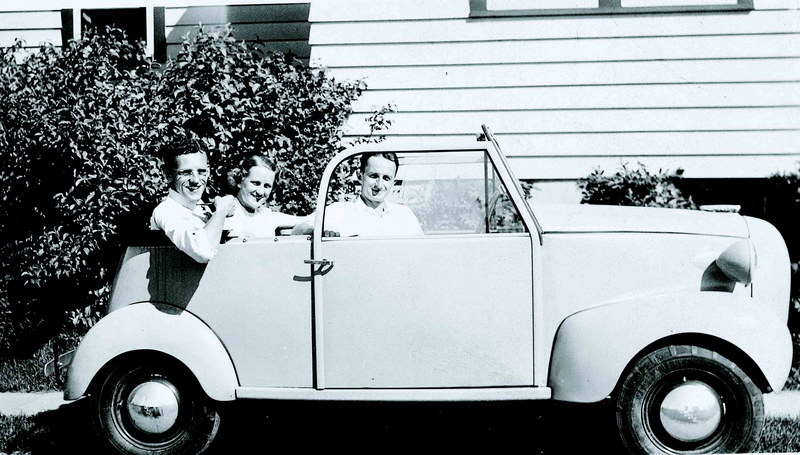 To sell the car, Crosley found that he already had a sales channel up and running. Crosley radio and appliance dealers covered just about every city and town in those years and they provided a ready made outlet for a new line of goods from a respected name. Over 300 dealers promptly signed up to carry his namesake car. This is not as odd as it sounds today. Both General Motors and Nash were major players in the appliance markets in those days (with the Frigidaire and Kelvinator lines, respectively) and consumers had no reluctance to buy their transportation from the same company that had made their kitchen appliances. By April 28,1939, the Crosley was finally deemed ready for introduction to the buying public. Powel Crosley was a natural promoter, and the debut was designed to make a splash and attract as much favorable press coverage as possible. The Crosley was unveiled at the Indianapolis Motor Speedway with all of the ballyhoo that he could summon. Later that week, the diminutive car was the centerpiece of the Crosley exhibit at the World’s Fair in New York. What the press and invited guests saw was a quite possibly the most spartan, plain car seen before or since. There was virtually no chrome trim or useless adornment on the outside. 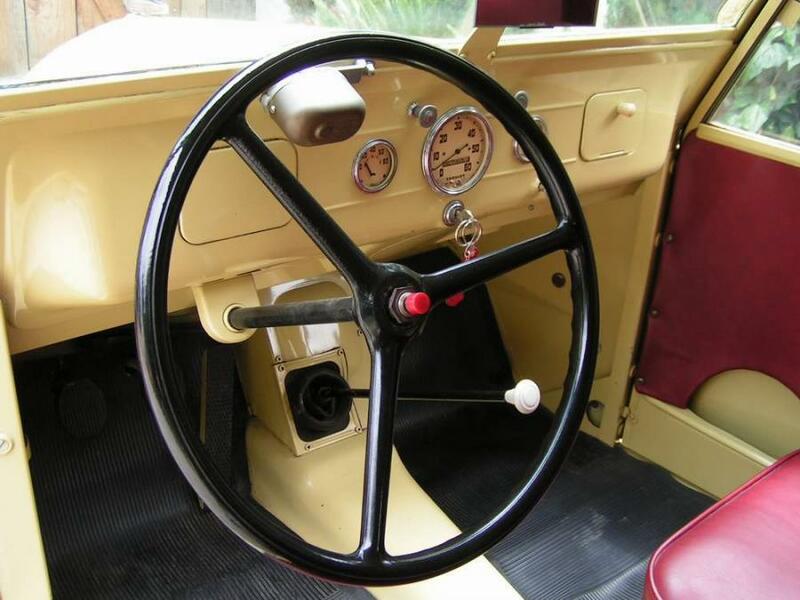 The interior was likewise simple,with only a speedometer, water and gas gauges and a three spoke steering wheel. Even roll up windows were not available in a Crosley. The car was tiny in every dimension – the 80 inch wheelbase was almost 15 inches shorter than a VW Beetle. The overall length stopped short of ten feet and curb weight came in at just about 925 pounds. To obey its mandate for economy in every facet of ownership, the car used a 12HP Waukesha air cooled twin cylinder engine for motive power. 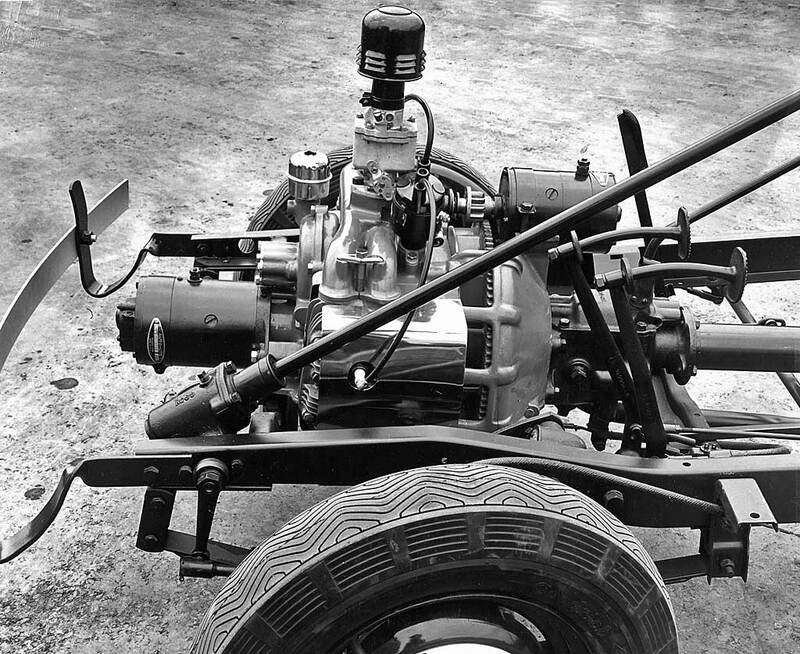 What power there was traveled to the rear wheels through a conventional three speed transmission . Crosley had set an ambitious goal of sixty miles per hour as the top speed, but to get to a mile a minute,the little twin would have to spool up to its engineered limits and stay there. But we must remember- there were no interstate highways in those days. The vast majority of long distance driving was done on two lane roads where even full size cars couldn’t go much faster than fifty due to limitations in brakes, suspensions and even the roads themselves. 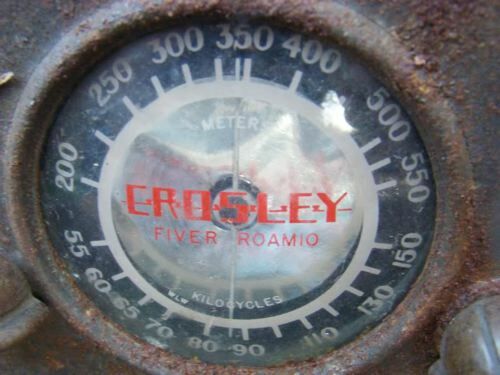 Thus the Crosley’s “comfortable” cruising speed of 45-50 mph was not as bad as it sounds some seventy years later. In many ways, the first Crosley models represented a step backward in time.Even though all major manufacturers had abandoned mechanical brakes, they were the only ones on offer in the Crosley. In an era when interiors were becoming more and more flashy and pretentious,the Crosley was like riding in a Model T. Even an all steel body was not available until 1940. The price was also a throwback : A $250 MSRP made the Crosley by far the cheapest car in America. When the U. S. officially adopted gasoline rationing on May 15th, 1942, the value of pre war Crosleys (below) jumped and the cars began to sell secondhand at a premium. 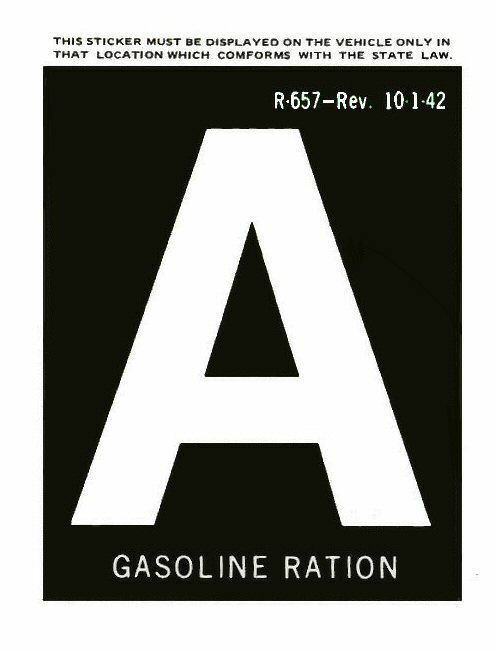 Drivers that were issued an “A” ration sticker (above) had to make due on 4 gallons of gasoline a week until further notice. That meant that the Crosley’s outstanding fuel economy was suddenly in demand. Wartime speed limits were also set at by the government at 35mph. This put the Crosley on an even footing with just about any other car you could possibly drive. During the war, the company built radios, cookstoves and gun turrets. But the most effective weapon turned out of the company’s factories was among the least known until after the war: the proximity fuze. 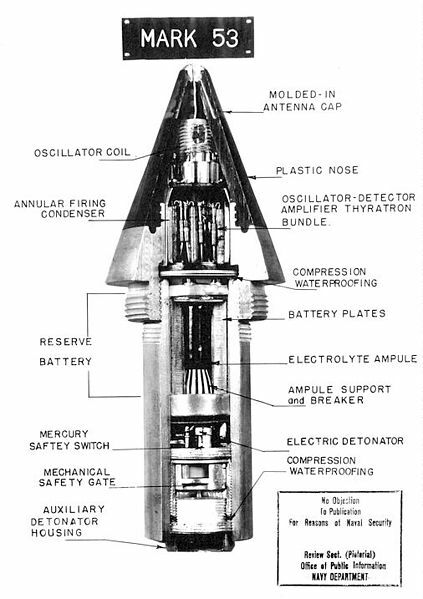 The proximity fuze used Crosley’s existing radio technology and the new science of radar to detonate an antiaircraft shell close enough to enemy planes to destroy them. It was no longer necessary to score a direct hit to bring down a deadly kamikaze or fast bomber. The proximity fuze made expert gunners out of 19 year old farmboys (or so the enemy thought) and saved countless lives in the process. Although the name was a half century from general use, Crosley had built America’s first Smart Bomb. As we have seen, after V-J day, America’s car makers raced to get a postwar model into production in order to grab some market share and resume their higher profit margin civilian business. The cars from the major producers were just lightly facelifted 1942 models, but after three and a half years of privation, buyers didn’t care. Anything on wheels would sell to a public desperate for cars. Crosley was late in returning to car production- the first postwar cars didn’t roll off of the assembly lines until early summer 1946. The delay was understandable because the all new Crosleys really were all new. A longer slab sided body that was still plain but attractive put the car’s styling closer to mainstream offerings. The 80 inch wheelbase carried over from pre war models, but the biggest change was in the engine room. The engine that emerged from Crosley’s wartime production for the Navy would be the secret weapon that the company hoped would turn a niche product into a mass market sensation. 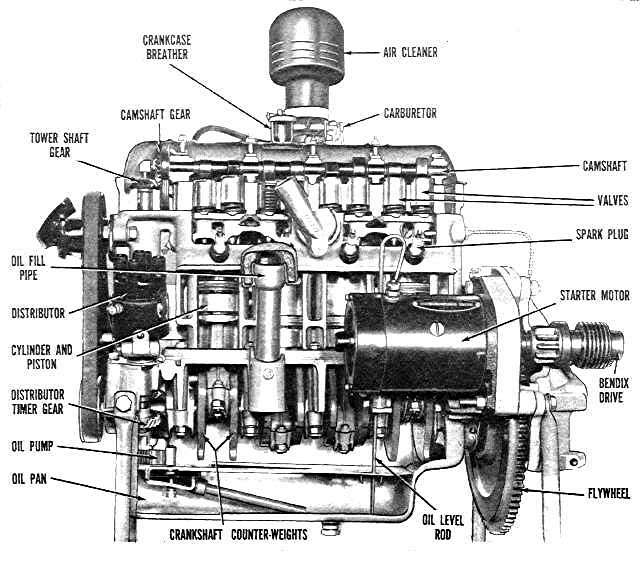 The so called COBRA engine that had been developed as a lightweight military spec motor during WW2 by Lloyd Taylor of Taylor Engines would forthwith be the engine installed in Crosley’s entire line of cars. On paper, the engine held great promise. The bare unitary block/head weighed just 14.8 lbs; complete with flywheel, the total installed weight was 133 lbs (60 kg). The little 724 cc overhead cam four produced 26 horsepower- double the air cooled twins output of just a few years before. And because the block and head were made from sheet steel, the COBRA cost a lot less money to build. The little four had powered refrigeration units and portable generators during the war, and its 44 inch displacement could return the same outstanding fuel mileage of the old air cooled twin and was quieter to boot. It seemed for a moment that the company had unlocked the secret to making money with a specialty product that sold in low volumes. But company engineers (and Powel Crosley’s brother Lewis) had warned the founder that the COBRA had some design flaws that would come back to haunt them all if not addressed, and as we will see, the warnings were not heeded. 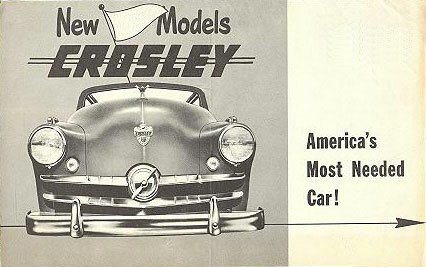 The resulting damage that the engine did to the cars reputation would go a long way toward wrecking the company’s finances and forcing Crosley out of the automobile industry. But for the moment, Crosley, like every other manufacturer, was busily trying to fill the overwhelming demand for new cars. The seller’s market was in full fury by the late fall of 1947 and production at the company’s Marion, Indiana factory was ramping up explosively. Postwar inflation had meant a dramatic jump in prices. The two door sedan was now priced at $905. This still made the Crosley the lowest priced new car on the market, but the price gap with the major makes was narrowing. The lowest priced Ford for 1946 “officially” retailed for $1074, but dealer mark up games usually meant that official prices were a fiction. Nonetheless, the Crosley had its best year ever in 1947 as nearly 19,000 units were shipped. The high tide for the car (and the company) would be reached in 1948, as just under 29,000 cars were built and sold. 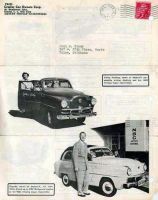 1948 also saw the introduction of the company’s first and only hit -the all steel station wagon. The wagon was so popular in those days before the major makes had adopted all steel construction, that for a while, Crosley sold about one third of all wagons produced in the U.S. This should have been a signal that the market would consider a somewhat larger Crosley, but management didn’t get the hint and plans for the next design cycle kept the cars subcompact dimensions virtually unchanged. This was another error that would come back to visit the company in due time. 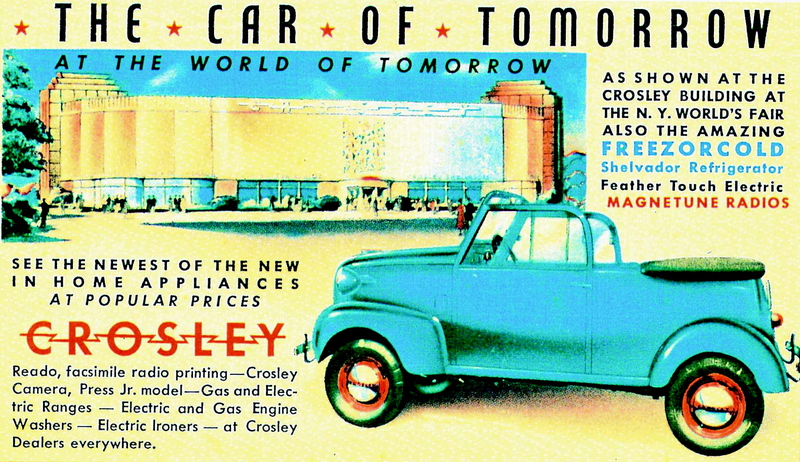 To keep the assembly lines running at a profitable rate, Crosley even marketed a small pickup based on the station wagon chassis. Even though the bed was small and the cab barely could accomodate two people, the Crosley pickup sold well enough to have its own assembly line for a few months in 1947. In the summer of 1948, tools and dies were being installed in the company’s factories for the new 1949 models that would compete with the first wave of all new designs from the Big 3 since the war. After steadily rising sales in the sellers market, Crosley Motors thought that it was ready to start making the first rung on the price ladder its exclusive turf and even expand its appeal to other areas of the small, light car market. To that end, the company followed up its success in the station wagon market by introducing the Hotshot roadster with a longer (85 inch) wheelbase and a starting price of just $849.The Hotshot was an clever niche car that could go fast and provide incredible handling and roadholding due to its longer wheelbase and radically low center of gravity. Braking was achieved by a new (and superior) technology that would come to be the cars longest lasting legacy- disc brakes. But just at the pinnacle of success and acceptance, the Crosley was destined to begin a descent into irrelevance and failure. Some of the problems that made themselves apparent in 1948 were of the company’s own making, others were just part of the changing business dynamic of the early 1950’s. 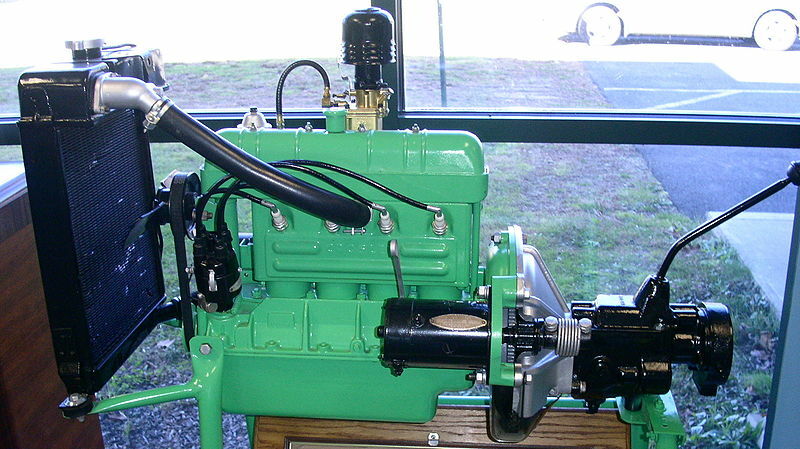 The first body blow to Crosley Motors was the long simmering issue of the COBRA engine’s tendency to develop tiny holes in the cylinder walls due to electrolysis. This was triggered by the use of copper and steel brazed together to form the water jackets and cooling passages. After a few months of use, defective engines began streaming back to corporate headquarters in Cincinnati as the company frantically tried to engineer a fix that would address the issue. Galvanizing was tried, but didn’t really remedy the problem and the company had to replace thousands of nearly new engines at great cost. The ruined powerplants couldn’t even be sold as scrap metal. It was slow to dawn on Crosley that an engine designed for the military was almost disposable-the Navy could replace them when needed and swabbies could do maintenance after every few hours of use. Owners of everyday transportation could not. The resulting bad publicity caused an alarming drop in sales late in the 1948 model year. 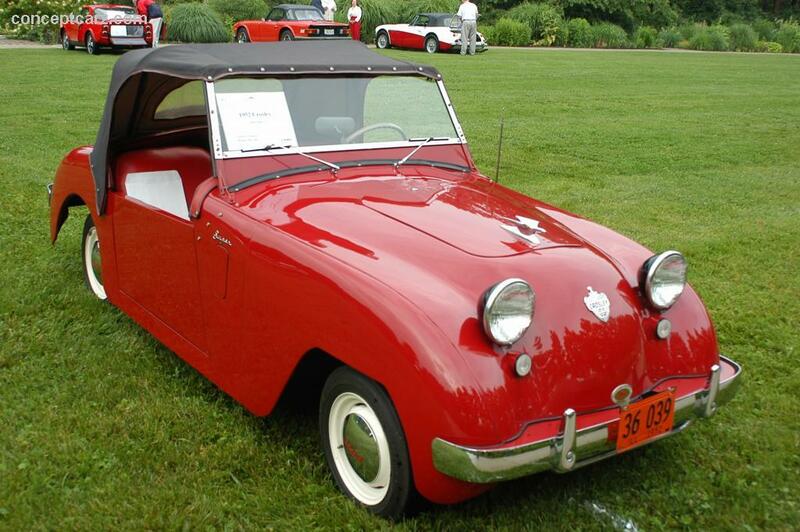 The 1949 Crosley debuted with new styling and a new engine. The troublesome COBRA was dropped for the CIBA (Cast Iron Block Assembly) of the same displacement and this engine proved to be reliable and long lived. The company tried to assuage furious owners of COBRA engines by retrofitting their cars with cast iron engines. Price guides of the day showed a dramatic drop in value for the COBRA mill. But just then another smoldering problem burst into flame. The disc brakes installed in the new cars began to deteriorate rapidly when exposed to road salt and another expensive recall had to be undertaken. Amidst lawsuits and disastrous press coverage, the Crosley was rapidly gaining a reputation as a lemon. Potential buyers also had a new range of market choices starting in 1950 that made the Crosley look like an even worse value for the money. 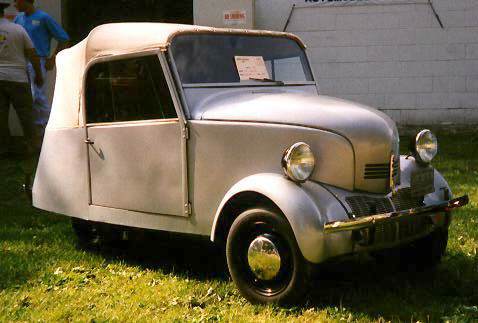 The first wave of compact cars from major producers had much more room , lots more power and proved to be much more sturdy and well engineered than the Crosley. Sales continued their collapse and by late 1951 it was obvious that the car could not survive much longer. 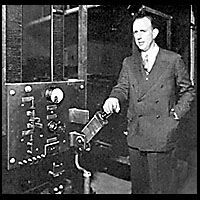 Powel Crosley had sold his broadcasting and appliance empires years before to concentrate on autos and had personally supported Crosley Motors on a sustaining basis for some time. Even though a wealthy man, he couldn’t sustain the company’s losses forever. So when he was approached by General Tire in the spring of 1952 about selling the company, he made the only rational move that he could – he sold out the entire operation for cash and stock. General Tire had no intention of building cars. It simply wanted to purchase manufacturing plants and the CIBA engine technology for other uses. The deal would also shelter General from high taxes by using Crosley’s losses to offset the parent company’s profit. 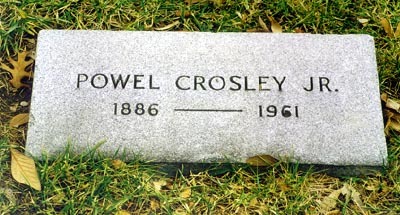 On the week of July 4th, 1952, a skeleton workforce assembled the final few Crosleys, punched out for the last time and the Crosley story reached its end. The Crosley came and went all too quickly on the American car market. The car’s legacies are mixed, even as we remember fondly today what its inventor tried to accomplish in the most unsettled time of the history of the automobile. Powel Crosley left the auto business for good after the sale of his company was complete. He still dabbled in big league baseball as owner of his hometown team the Cincinnati Reds, but his best years were behind him and he died of a heart attack in March 1961. General Tire remade its self as General-Aerojet after buying out Crosley Motors and set about finding new and novel applications for the CIBA engine. There was some defense contract work through the 1950’s and the engine powered refrigeration units for many years on container ships and other transport platforms. The engine was even marketed as a marine unit for several years and was moderately successful. General Tire eventually diversified out of the tire business altogether (ironically, for broadcasting) and sold its namesake operations to Continental Tire. The Crosley radio and appliance names live with us still, but the current company that uses the brand has no direct connection to the original corporation founded by Powel Crosley. The trade name was resurrected to provide instant recognition for a generation of consumers that knew that they could trust products with the name Crosley. The cars one feature that lives with us today is the disc brake. 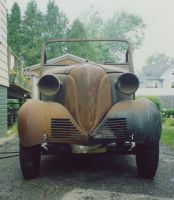 Although the Crosley units were prone to rust and warpage, later development remedied those problems and by the end of the next decade, disc brakes were becoming common (especially on the front) of many new cars. Today, discs are standard equipment on just about every new car sold in the U.S. The Crosley car itself was soon consigned to the back of used car lots as a bargain basement problem child that could often be bought for a lot less than $100. The COBRA equipped cars fell off the road pretty quickly and it was often a prudent decision to scrap a Crosley rather than pay for an engine swap. Rebuilds of the COBRA were rare. Also, the coming of high speed interstates in the mid and late 1950’s meant that the Crosley was now functionally obsolete because it could simply not attain the high speeds that were required for freeway cruising. Many were parked behind barns and under sheds and forgotten. Those few that do survive have a dedicated, but small following. Most car spotters have never seen a running Crosley except at a car show. The one model that has obtained coveted collector status is the Hotshot. Prime examples fetch big money today and change hands infrequently. I am 74 years old and still have my Crosley. Being a girl with my own car in high school was exciting. I was stopped by the cops for having too many kids in my car. It was sometimes a surprise to find my car at some precarious purch, put there by envious boys I suspect. It is shown at the Crosley Automobile Club annual convention in Wauseon OH, held every July. Mr. Tipton, I am honored that you joined our discussion.I’d also love to see a picture of your Crosley. If you have one, it would be most welcome ! LOL. Exactly my thoughts too !! America’s version of the 2 CV !! 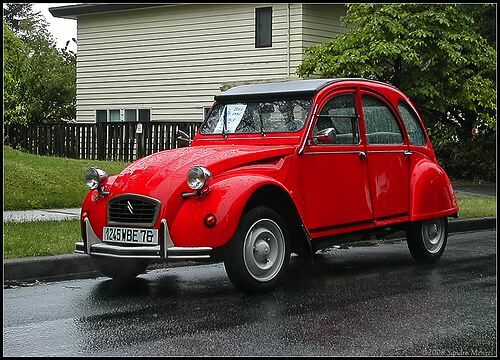 But the 2 CV was a lot more successful , but just as cheap looking. A great piece on a car I did not know enough about. You all know that I am a fan of cars built in Indiana, but I never knew that the Crosley was built in Marion. I guess I will have to summon some love for the homely little thing. The last one I recall seeing was one of the late station wagons being used as part of a display in the menswear section of a department store. My kids (who were then under 10) loved the idea of a real car scaled to their size. Truth be told, I would really love to experience driving one. With the decent engine, it is sort of a modern Model A, just smaller. My beloved grandfather owned one, right after WWII. He was a man who liked to get by and spend as little money as possible, so naturally, the Crosley appealed to him. He bought it new and lived to regret that purchase nearly every day he had it. Even as a child, decades later, I would watch my grandmother’s eyes roll and boil whenever the Crosley came up in discussions. At the time he bought it, he had been just released from military service, had a wife and three kids. He bought up a ladies’ wear store that was going out of business, then struggled to turn it around. 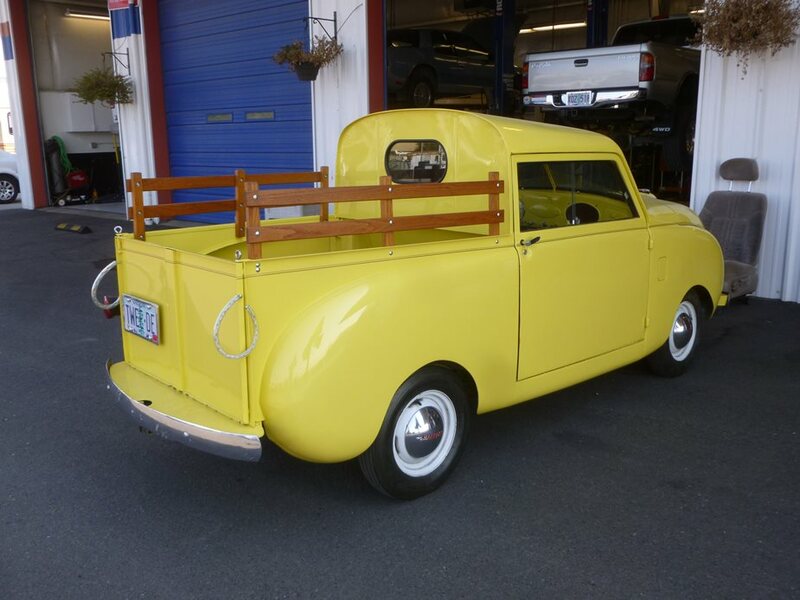 He needed wheels and thought he found the deal of the Century when he bought the 1948 Crosley wagon. Our family was embarrassed by the car. It was so small, my grandma wouldn’t allow the kids to ride in it. Understandably, my father and my aunt loved it, being just their size. Riding in it however, made my grandmother unhappy and nervous around Chicago. She believed it was unsafe, and she was right. Every other car towered over them. Wherever they drove in the Crosley, they got laughs from other drivers. My great grandparents were also appalled at it. My grandfather’s brother offered to buy up the failing ladies’ wear business, the Crosley, and begin a chain of men’s wear stores in South Chicago. The Crosley was replaced by a nice Nash Ambassador, and the Crosley ended up doing parades in Chicagoland for their stores. The engine failed and had to be completely replaced. It started rusting badly within a couple of years. It couldn’t be driven on the new Calumet expressway, and couldn’t run on cold weather days, which in Chicago, is often. It had no traction in the snow. It had poor heat and no defrost. Grandpa had a slew of cars, many of them complete lemons. His list of losers starts with the Crosley and his last one was a lemon filled Jeep Cherokee. He always loved his cars stripped down and simple, as though he was a Mennonite. He liked automotive values, so he was always a sucker for the cheapest rides in the dealerships. I can’t even begin the stories about his GM X-car Olds Omega! So, I’ve always been aware of the Crosleys, and have always understood them to be impractical, dangerous and poorly built – based on family lore. My dad bought a 1948 Crosley station wagon for parts to repair his 48 sedan from John Fary. We live on the Southside of Chicago near Daley’s home in Bridgeport. 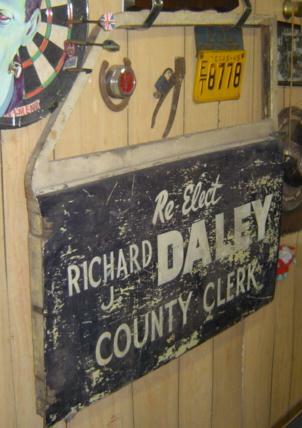 Congressman Fary campaigned in a Crosley station wagon for former Chicago mayor Richard J. Daley when he ran for Cook county clerk. This is the door off the car that he saved when he scrapped the body back in the 50’s. My sister remembers the campaign car painted red,white and blue. I have the door hanging in my garage. It would be great to find pictures of the car In a parade or just parked I’ve been searching the net. but nothing comes up. realize this post was while ago and don’t know whether you get a notice of this reply. Hope so. If you still have the door would you be interested in selling it? Huh, that’s actually a lot more attractive (and interesting) than the kei car my company had my driving for about five months. I never want to own a car that small ever again, however. Ditto Jeff…great history that filled in some blanks for me. Powel Crosley’s former radio station in Cincinnati – WLW-AM – is still on the air and doing well. General Tire’s efforts in broadcasting actually began in 1949. 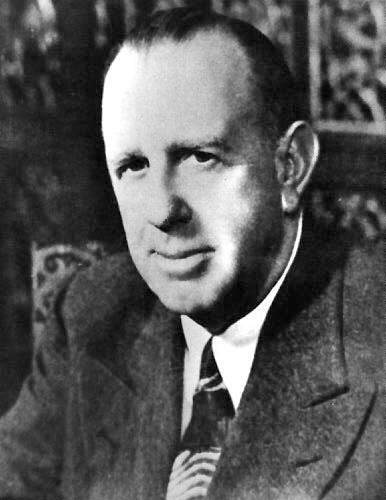 Thomas O’Neil – the son of the company’s founder – told his dad he liked broadcasting better than the tire business, and so General assembled a chain of radio and TV stations. In the 60’s and 70’s RKO General’s radio stations – KHJ/Los Angeles, WRKO/Boston, CKLW/Windsor-Detroit, KFRC/San Francisco and others – consulted by radio guru Bill Drake – transformed music radio into the way we know it today…for better or worse. A litany of improprities became RKO General’s undoing; in ’87 an exasperated FCC finally told them to sell their stations before they took away the licenses. They exited the broadcasting business for good in 1990 – three years after spinning the tire business to Continental. Today “GenCorp” consists of two main businesses: Aerojet and real estate. Anyway, I’d heard about the disc brake issue before and just figured the rotors were simply exposed to the elements in a way not seen on today’s cars. But the picture above makes it look like those brakes were well protected, so I assume it was a problem with the metal used to manufacture the rotors. As a former broadcaster, you just filled in an important gap. I remember their troubled end, but didn’t realize it started with Crosley. Paul, IMHO I’m more inclined to call it where Crosley and General converged. As a current broadcaster – and radio junkie since my teens – the places where the radio/TV industry bumps up against other facets of Pop Culture fascinate me. I remember listening to WRKO back in the late 70’s, running General Tire spots with the old jingle “sooner or later, you’ll own Generals” – and wondering if they paid WRKO for the time since they owned the station? As a young adolescent, listening to the clear channel AM’s late at night on a GE transistor captured my imagination so strongly that I went into the business of broadcasting. It was every bit as exciting on the other side of the microphone as it was to listen. Today, I travel to Cincinnati frequently and WLW is one of my presets. (I also like 55 WKRC). great piece, jeff. this is why i love this site. i’m fascinated by radio stations that still have only 3 call letters. i assume they are the original broadcasters. in new york, we have have wor-am which is a former rko station that’s been on the air since 1922. my father often talked about how much jean shepherd’s show influenced him as a child. and let’s not forget long john nebel or bob & ray. sorry this is a car blog… btw, i have a background in broadcasting, too. is their something about broadcasting & old cars that attract the same guys (not many women here)? I don’t have a background in broadcasting, though I’ve been fascinated by radio of all types for years…I think there’s a great deal of overlap among enthusiasts of old cars, old radios, film cameras, fountain pens, and other assorted “obsolete” technology–I’ve dabbled in all of those, with varying degrees of obsession at various times. Our local “blowtorch” station in LA is KFI, which is now a talk station but started off as a “farm information” station (thus KFI). And I grew up in the shadow (almost literally) of WSM, which is the last clear-channel AM station still broadcasting with an all-music format. Excelsior!!! Many of the family stories Shep told on WOR and in print, about childhood in pre-WWII Hammond, Indiana, ended up in the Christmas Story movie. After listening to him during the tail end of his radio career, I’m really glad his movie became a durable part of the American holiday season. The Old Man’s ’37 Olds Six would make a fine CC if anyone could find one. The guys over at http://hooniverse.com/ have the same taste in cars as most of us. They also like older tech so much they spun off a new site http://atomictoasters.com/ to indulge in their other interests. Interesting articles on both sites and a knowledgeable and friendly corp of commenters as well. AM 700 WLW has for many years been “the nation station”, (allegedly) reaching 38 states, Canada and Mexico. I can attest that I could at times pick it up when I was living in Texas. Another tidbit. I mentioned this feature to a co-worker who grew up in Cincinnati. He remembers visiting his grandparents’ house and playing with a little racetrack that used small windup Crosleys as the racecars. I would guess that these setups were sold at the radio and appliance stores, but this would just be a guess. Another local bit of interest, is Powell Crosley’s Cincinnati radio station: WLW. This was the 800 pound gorilla of broadcast stations, broadcasting at 500 thousand watts in the 1930s, using monstrous water-coolded tube transmitters that were in regular service through the 50s. I have read that WLW was considered the 1920s equivilent of NASA. WLW is still broadcasting as a clear channel station at the max-allowed 50,000 watts, and at night (when max power clear channel broadcasting is allowed) it can be heard over much of the USA. I know next to nothing about broadcasting and was wondering why there is a limit of 50,000 watts today? Interference. As soon as WLW cranked up to 1/2 MW at 700 kc, Canadian stations at 690 and 710 complained of interference. Crosley added more antenna elements to direct the power away from the north. 50 KW turns out to be a good level in the AM band for solid metro-area coverage without blowing away other stations. Thanks for the info. I wrote down some of those stations to see if they’ll come in on my car radio! In my Iowa City days as a kid, it was KAAY, Little Rock Ak. All the kids listened to it for the latest Top 40 hits. Having to learn from any place in Arkansas for modern culture…wow! Whenever I hear “Monday, Monday” by the Mamas and Papas, at the end I always hear “ding – W A B C!” in my head. Nice piece–I remember reading about Crosley and about the problematic engine, but I had never understood exactly why it was problematic. I also remember stories about WLW at its max having listeners as far away as the Australian Outback, due to its signal that all but blanketed the entire planet. Its transmission tower is a twin of the WSM-AM tower near Nashville (another clear-channel 50KW station with a long history), an unusual “diamond” design. AM radio waves are bounced back from the ionosphere at night, and can travel all over the globe. I remember picking up a UK station one night on the road in Pennsylvania. Ah the joys of a vintage radio I had as a kid the aerial hooked to a wirewove bed the shortwave band could easily pick up US radio stations. As a kid in lonely, boring NE Oklahoma, I would sometimes very slowy scan through the AM dial in the middle of the night. I am almost certain WLW was one of the ones I heard. Another one was some big station in Toledo, Ohio that I remember hearing many times. I always was fascinated by listening to their local news for some reason, as if I was eavesdropping. You probably also picked up WOWO from Fort Wayne, Indiana, which until a few years ago, was still one of the old-time 50 thousand watt clear channel stations. I grew up listening to it locally and remember anecdotal reports that under certain weather conditions, GIs in Vietnam could pick up the station when it was at full power. Listened to WOWO many times late at night on my tube type receiver that I bought at a yard sale as a kid. The signal was so clear that I thought that they were in the next room. Nice to see that everyone is almost as interested in the radio tech as the car! As mentioned elsewhere, we probably all like the same old stuff whether it has wheels or not! Here is an interesting old tube I found in an antique store. I have no idea what it is from, but I figure it is the first piece for my robot space ship! Several years ago, PBS ran a Ken Burns production (IIRC) called “Wizards of the Air”, which featured Mr. Crosley and his incredible radio station. The radio station itself was a marvel of engineering at the time. (Note: If he were alive, he’d be 98 years old). With that background, we always had at least one SW radio in the house, usually several. On fall evenings, we’d build a fire out in the backyard, put up an antenna strung between a couple of trees, crank up the battery powered Zenith and listen to the world. All three of us sons have at least one SW radio, and one of my goals is to get one of those wooden case Zeniths for my own collection. I am fortunate enough to live within the 24 hour coverage area of WSB. It is one of this country’s great radio stations. KDKA’s one of my CBS/Pittsburgh sister (or is it brother?) stations. When you walk in our lobby, there’s a huge picture of KDKA’s first broadcast – 11/2/20 – airing the 1920 presidential election results. The day I don’t get a l’il lump in my throat seeing walking by that bit of history is the day I need to quit the business. I understand your thing for these old radios. Several years ago, a friend’s mother passed away, and he was getting rid of a lifetime of accumulation. Among the stuff was a pre-WWII cabinet-style am/shortwave/phonograph (78 rpm only) made by the Bendix Aviation Corporation of South Bend, Indiana. He gave it to me and I took it into a radio shop to have a couple of things tweaked. I can’t say that I use it much, but it is fun to spin that shortwave dial and hear stuff from all over the world. Geozinger, you’re right, but it’s called “Empire of the Air”. Armstrong, Sarnoff and DeForest were the famous Jobsian wizards of their time, the end times of independent inventors and the rise of ruthless mega-corporations. They fought brutally, to the death in Armstrong’s case. It’s one helluva story. 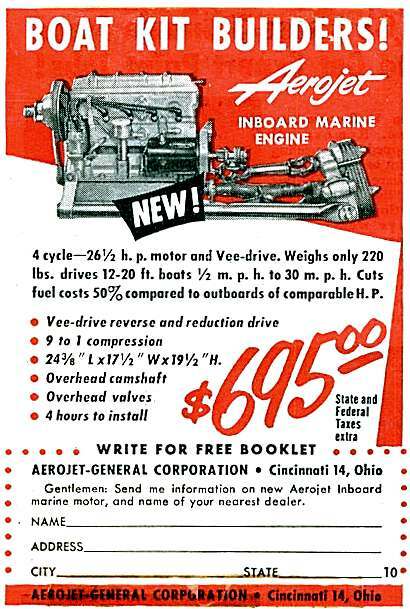 The Crosley engine also lived on to become Americas first big 4 stroke outboard motor-the Homelite Bearcat, 55hp, and WAY ahead of its time. Early Crosleys are commonly re-powered, like this one with a 24 hp Honda V twin I saw at hemmings just the other day: http://blog.hemmings.com/index.php/2011/10/18/lil-zippy-a-pre-war-crosley-with-a-secret/ Makes them quite a bit more “driveable”. WLW got a special Class 1-A license to run 500 KW in 1934, and FDR pushed the ceremonial button to turn it on. 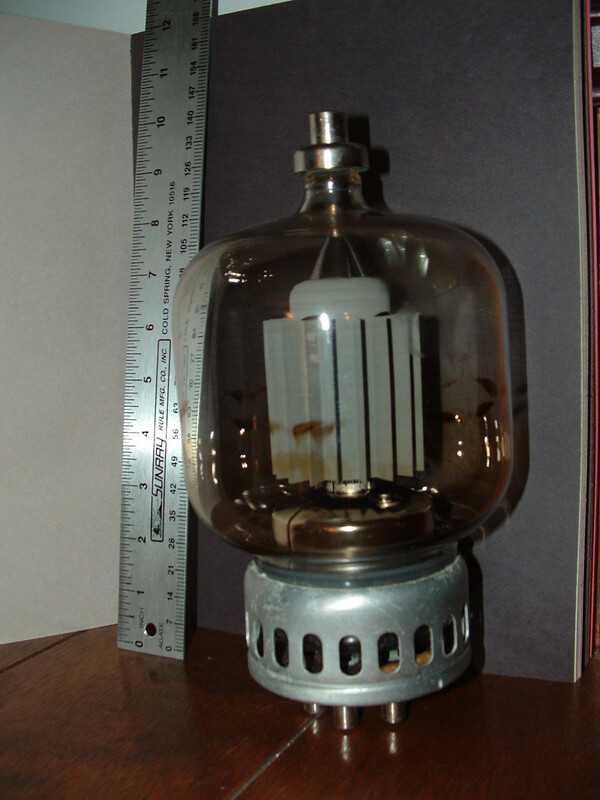 WLW’s “RCA 1” transmitter was a spectacular flame thrower. The tubes alone cost a half million bucks in today’s money. It had a 400 KW audio amplifier just to modulate that power. Imagine the sound that could have made. People claimed they could hear WLW on their bed springs. Fabulous article Jeff! My dad bought a new Crosley after the war, I’ve gotta show him this story. I once worked at a 50,000 watt blowtorch AM (WFLI ) back in the day. It used a water cooled transmitter and the daytime pattern had to be changed to prevent co-channel interference. If I recall, we had to power down and then a series of mechanical wheels would engage the cooling pump around the base of the tubes (which glowed bright orange). When you went into the transmitter room on full power, every hair on your head would stand up. I can only imagine what half a million watts would be like. The chief engineer at the station where I work toured the WLW transmitter site and brought back some fascinating artifacts. And he says the Big Switch shown above still exists! The diamond-shaped tower is a Blaw-Knox, made by a company based just outside of Pittsburgh…in…Blawnox. I own a Crosley: a 1940s or early 50s Shelvador upright freezer. Found it at a garage sale for $25, and I re-insulated it with foil-faced rigid foam. It now uses the same amount of electricity as a new freezer. That’s very interesting! Not that I want to de-rail here but.. How did you re-insulate? Did you dig out the old stuff and fit the foiled foam? I slapped on the rigid on the outside over the box; top, sides, and bottom, because taking apart the insides was likely impossible, since refrigerant runs through the shelves in small channels. I did open up the inside of the door, took out the old wet fiberglass, and fitted a piece or two of rigid, and taped it up with foil tape. This was some 15 years ago or more; works like a champ. I see. I’ve been wondering if there was a way to “update” some of these old machines. I have a friend with an IH fridge in his garage that I may get a chance to experiment with. There are a couple of companies that specialize in restoring and occasionally updating old refers. 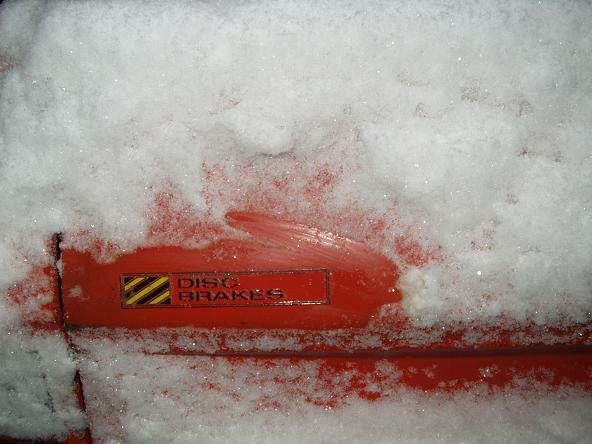 The IH fridges and freezers are very durable. I know quite a few people who have operating units. They are actually relatively efficient. I almost got one a few years ago. A co-worker of my wife was selling the old family home that was too big. It had been in her family since new constantly in use. She first offered it to her kids and no one wanted it so she asked my wife. As soon as one of her son’s heard that I was coming to get it the next weekend it suddenly became desirable and he took it. I wish I could add more than has already been said about Crosley. There are still several of the cars on the road on the west side of town, but haven’t seen one in a while. I did see one on I-75 traveling south just outside of Dayton – some big fat guy who could barely fit in the car doing all of 45 mph. Scary at best and I did a few triple-takes when I gingerly passed him. I hope he made it to his destination in one piece. As for WLW, the transmitter is in Mason, OH, about 7 miles from my house. Stories were told back in the day when they were transmitting a half-million watts that people were picking up the signal on their water pipes, tooth fillings(!) and such within a certain radius of the tower. FWIW, the former Voice of America grounds is nearby as well and has been turned into a park, a college campus, a shopping center and the building a museum. When I was growing up, our across-the-block neighbor was a ham radio operator and had two telephone poles at opposite ends of his lot with an antenna strung between them. Anything in our house (AM radio, electric guitar, phonograph) connected to a speaker could pick him up when he was broadcasting! Across the street from his house was the Catholic church that I attended; they had to turn off the PA system when my neighbor was on the air for that same reason (the priest was understanding as he was also a ham radio operator – you just can’t make this stuff up). Yes, in the old days ordinary radios, guitar amps, stereos, TV sets were pretty badly shielded and picked up all sorts of stuff. It must have been crazy in southern Ohio in the ’30s. Hams were allowed up to 1 KW max, most ran a lot less. Compared to WLW’s 500 KW that’s a whisper. In our RF-saturated present day it’s not too much of a problem. There’s so much radio power out there everything’s pretty well shielded. Once in a while you hear FM radio on the phone, they run at 100 KW and up. In case anyone is interested, there is a Hot Shot for sale in Maine… Only a few hundred miles from my house no less. I remember reading the grapes of wrath and how the Joad’s truck would only go 35 mph. I can only imagine the hell of putt-putting thru the New Mexico, Arizona and California deserts in a worn out jalopy at 35. An interesting thing (IIRC) about the proximity fuse is that it used the casing of the shell as the antenna. I had always thought that the shell sensed the reflection of ship-directed radar off the target to detonate rather than being it’s own transmitter until I researched it. Another interesting fact is that each fuze cost $18 in 1945 dollars down from $742 per fuze in 1942. Multiply that at 15 rounds a minute a barrel times the total number of 5″ guns (5 guns on a destroyer and 20 on a cruiser and battleship) in a task force repelling a kamikaze attack! In a very real sense, it was Powell Crosby that won the war for the Allies with his invention of the proximity fuze. Imagine how much longer it would have dragged on without it and how many more lives would have been lost if it hadn’t been around (or, worse, been invented by the Axis first). I’m not sure I would use the word ‘genius’ but the PF, along with his previous amazing refinements in mass producing low-cost radio and refrigeration, are worth giving the man a pass on his failed attempt at a cheap, practical form of transportation for the masses (particularly considering the introduction of disc brakes). It’s also another great testament to how difficult it is to start and maintain an automobile manufacturing enterprise. Fewer impediments and barriers in place at the political, social and economic levels… especially compare to today with decades of collusion between BIG government and BIG business. Far too complex to discuss here but my decades of non-fiction reading of a huge array of topics has led to but one conclusion and when I hear that prez. wanna-be spew that is ALL YOUR fault for not having attained his level of economic attainment I shudder in outrage!!!!!!!!!!!! Excellent article and a look at a bygone era. Have an autumnal autumn and may your accumulated leaves be colorful and the gusting winds blow them all to distant other folks’ yards. Oh heck, for general info… the impetus to create a nation-wide everywhere by everybody speed limit of 35 mph was not to reduce gasoline usage… but to reduce the need for replacement tires at the home front. Less speed less friction… make existing tire stock last longer. I’d better chip in here, since I have actually owned a Crosley. I remember it as being a 1948 model, but it had a conventional cast-iron engine. When I bought it from my then landlord in 1962 in Corvallis, Oregon for fifty bucks, it was faded red, and the inset panels on the rear and sides were painted in white. I drove it downtown a few times, but when I essayed a long-distance drive all the way to Monroe and back, the temp gauge needle started to climb. I was a grad student at the time, and being short of both time and money, I ended up towing it to my old western Washington area and selling it to the guy who ran Five Mile Lake Garage. Got my $50 back. Something that hasn’t been said here yet is that Crosley came to Kokomo, IN in 1935 and occupied the former Haynes Automotive Company (one of America’s very first automotive manufacturers) body plant on Home Avenue, where Crosley car radios were manufactured. He sold to GM in 1936 and this was the start of Delco Radio, which became Delco Electronics in 1970, and then Delphi in the late 1990s. Lots of automotive history there in the City of Firsts! I worked at that plant in the mid-1980s while in college, and they were still manufacturing the mechanically-tuned pushbutton-preset AM car radios there (before that line got shipped down to Mexico, where Delco had two manufacturing plants at Matamoros & Reynosa). Everything is gone from that location now save for the former Delco Administration building (circa 1954) that is now being used for “economic development” by the city. Good Lord this awakes some memories! My father’s first car after he was discharged from the Navy after WWII was a 1950ish Crosley station wagon. I was probably 5 years old. We lived in a very hilly part of Appalachia. Most summer weekends we would pack the family (Mom, Dad, Older sister and me) in the Crosley and head out to some park or lake for a picnic. There was a particularly steep hill on the way to one lake that the poor little CIBA engine couldn’t make even in first gear. So my sister and I would hop out and Dad would back up the hill (reverse gear was numerically lower than first) and he would wait for us to climb up to the top and off we went. Such events seemed normal in those days. Ahh the 1950s, so simple. I think I cried when my Dad traded the Crosley in on a 1956 Henry J. The guy I bought my Midget from was a Crosley fan. He had 2 projects going at once and decided the MG was too much for him. I guess Crosley was always under my radar, I knew of the cars and appliances but I never realized the history behind the brand. This kinda gives the automotive history buff in me fuel to learn a bit more. Another car Ive never seen in person but I doubt Crosly got into exports. A friend many moons ago had a Bradford bt Jowett 2 cylinder van so Ive experienced 2 cylinder motoring its ok if you arent in a rush. Crosley did export a few (and I mean few) cars to the U.K. 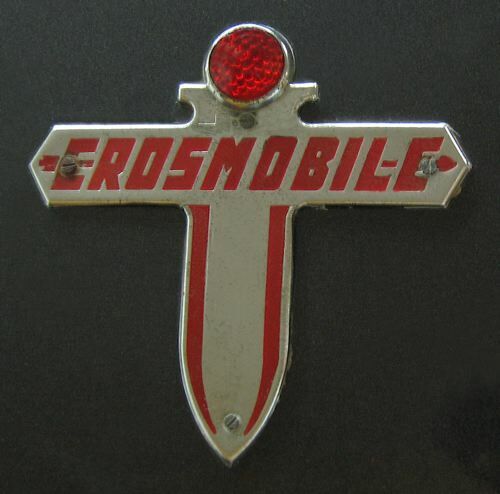 Since there was a car with a very similar name already in existence, it was called the “Crosmobile” in Old Blighty. It seems to me that it would have made sense to export the Crosley overseas after WWII because gasoline then as now was very expensive.Also, the simplicity of the design should have made left hand/right hand drive conversion a snap. Most likely, the protective tarrif on imported cars in other countries made this impractical. Fascinating details are lurking in these images. 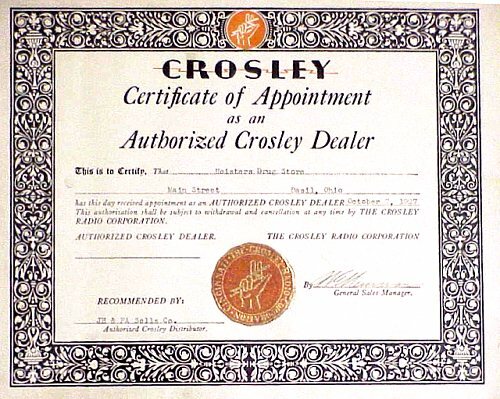 Starting with the official certificate granting a Crosley dealership to… a drug store? On Main Street? Crosley’s product line wandered far and wide, didn’t it? Besides autos, they made cameras, engine washers and electric ironers (the housewife’s laundry set, or something quite different? ), and “Reado,” your first source for “facsimile radio printing.” Kinda makes Sony seem like a narrowly focused specially maker. 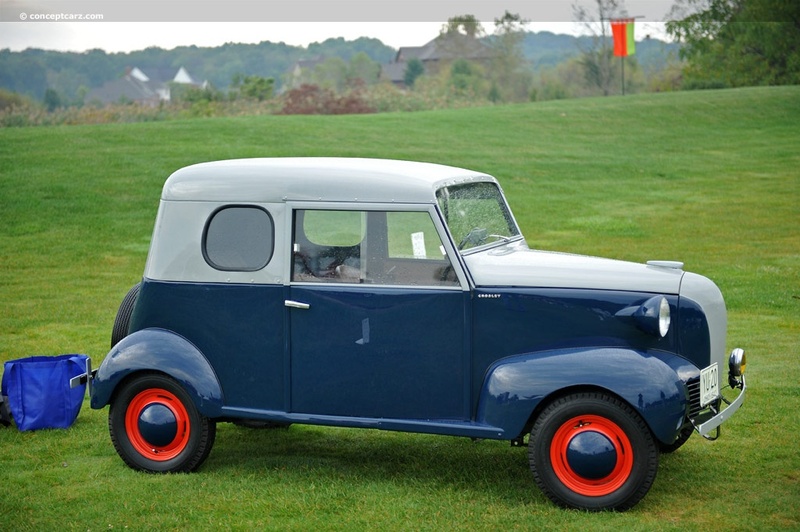 The ’42 Crosley was a broad line of five cars, all apparently identical below the hood line. Pick a roof and you’ve picked your model. Why, you could change your Convertible from Coupe to Sedan simply by swapping for a ragtop with rear side windows. 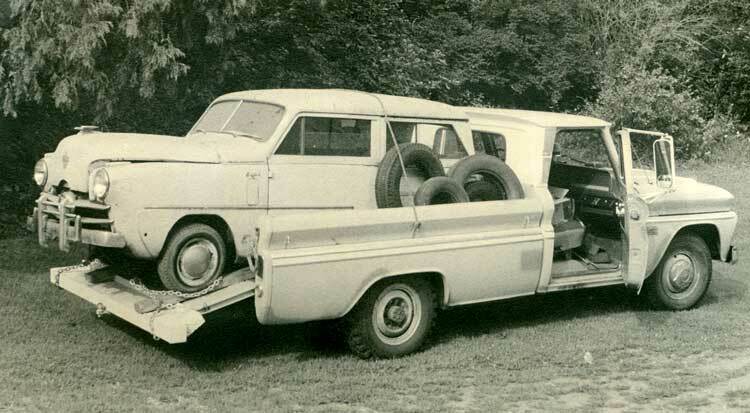 The Pickup Delivery and the Covered Wagon distinguished themselves with a rear cargo box, with tie-downs. Don’t you just wonder what lost combination of balmy weather and livery duties made the Parkway Delivery so desirable? Soon, America’s Most Needed Car looked like it needed wheels and tires, as least as depicted in the ads. Always shy about showing its wheels, that cute red Hotshot looks to be drawing its rear wheels inwards, towards the narrow track of that original CRAD prototype. So many great brands live on as ghosts, stuck onto Chinese crap. Polaroid, Westinghouse, RCA, Zenith, Fisher. Maybe even cars someday…there could be a Pontiac even worse than the Korean LeMans. If not from China then the next bastion of low wage crapola. Unless we finally build some good schools and smart robots and take back manufacturing. I think we’re judging the conditions in the old days by our standards today. We expect a new car dealership to be a professional affair, by most standards. I can remember the sleazy used car dealer who bought a Datsun or Honda franchise, and 30 years or so later and now they’re a semi-respectable member of the community. I have to imagine that in some towns that there were folks who had the money to diversify their businesses would do so. Or possibly set up a son in a new business. Some of these folks were the only ones of the means to do so, and they did. Sears doesn’t sell Henry Js anymore either…. But you can get electric motorcycles at Best Buy. Here’s a Crosley “Roamio” car radio, located in some badly corroded dashboard, but with “WLW” clearly visible at 700 kc. Mike, that is a GREAT find ! Jeff, Thanks for the great overview of Crosley. Back in the late 50’s my uncle gave me an old ’42 to drive around the back fields. What fun! I especially liked the very detailed picture of the flat twin in your piece. It brought back a lot on memories, especially since I drove it without the body. Mike, thank you. Your comment made my day. 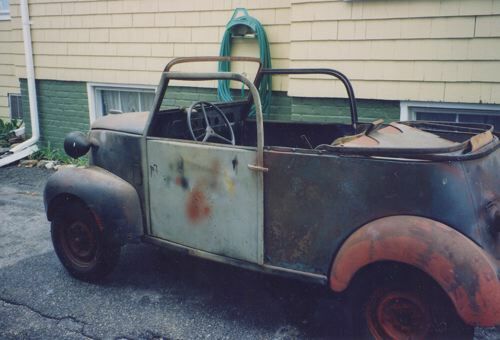 I just purchased a ’42 Crosley Convertible Coupe to restore. I have traced it back to the original owner, who purchased it at Macy’s Dept Store in NY. I have pictures of the second owner’s son beside it when he was 3. WWII had just ended! It is relatively complete, and will be a fun restoration. A really nice piece of work. Somebody bugged me a while ago about doing a story about Crosley — I may just refer them here. A very good read on what this Crosley motor company was! Thanks! I thought I saw a Crosley wagon at the Bainbridge Island 4th of July parade and street fair. The car was restored and a wagon at the car show. That was a couple of summers ago too. Back in 1988, I began my tenure as a student at what was then KTPS, Ch. 28, a second tier PBS station that was part of Bates Technical College as a student in their TV Broadcast Tech program, learning all there is to broadcasting, including all the technical stuff to get my SBE license, of which I DID pass. At the time, the station was still at their downtown campus where it’d been since going on the air in 1962 but originally broadcast at Ch. 62 on the UHF dial. Sadly, no archival photos of the station over the years. The master control room used to also house the transmitter, that is until 1981 when a huge wind storm came in and blew down the tower that was on top of the building, sending it crashing down onto the intersection of 11th and Yakima Ave’s, forcing it off the air, well, all but those whom were on cable and or lived within a couple of blocks from the station for I think a year before that was rectified. They then leased the old KMO/KTVW station site out on N. Shirley in N. Tacoma for use as a new transmitter and tower site. The site had been an independent station that began life as KMO and the building went on the air in 1953, later due to poor reception and no network material, it within the year was bankrupt and Elroy McCaw, the father of Craig McCaw, the cellular phone magnate and he renamed the station KTVW and moved the studios out from the old Roxy theater building downtown to the transmitter site and limped along as an independent. Eventually, the station went off the air as an independent for good in 1974 and was left empty when Bates took tenancy of it in 1981, they cleared out the old transmitter and bought a new one and petitioned for a frequency swap from someone in Seattle for their Ch. 28 in exchange of KTPS’ old Ch. 62, so back on the air it went with the same call letters, but now at Ch. 28 instead in I think early 82. I’ve read a great book on the Bullet family called, KING, the Bullitts of Seattle and their Communications Empire, published in 1996 and it goes into detail of how KING came about, one of the country’s earliest TV stations to go on the air after WWII and Seattle’s first, beginning with the first ever HS football game to be played on Thanksgiving day, 1948 as KRSC and it was televised live in all its grainy, B&W glory, complete with technical glitches and all on a cold, but sunny day with a muddy field to reflect sunlight and cause other technical problems where cables got wet. Dorothy Bullit would buy the station from its original owner and renamed it KING after buying it in May of 1949. The book goes into the history of the Bullitts and their empire through the years. Very interesting read (had to look up the stuff I just wrote above since I could not recall all of it by memory). Also, Seattle still has one of its 3 call letter stations, KJR, is the longest running station in Seattle since it went on the air in 1922. In the 60’s it became a premier top 40 station and had competition from KTAC in Tacoma and KING AM (1970’s only before switching to talk radio). KJR now is talk radio too. Today, I don’t do broadcasting but its rich history, the older gear and old radios and TV’s I find very fascinating. Used to have an old Zenith shortwave radio fro the 60’s, it’s major issue was the scratchy sound it made when I rotated the dial to change bands from SW/MW/LW to AM and FM and the dial faceplate would not remain on and eventually, a capacitor developed a loose connection as it was easily hit by the battery compartment that one would take out to install I think 6 D sized batteries and was where the power chord would also be stored. It was fun listening to shortwave radio and just now realized my emergency radio has SW1 and SW2 bands, but a quick scan got nothing but static though it is in the late afternoon as I type this. All of this is fascinating stuff! Jeff- this is a really nice overview- as a Crosley fan I’m used to articles with piles of errors- and it’s great to see an in-depth and accurate rundown. 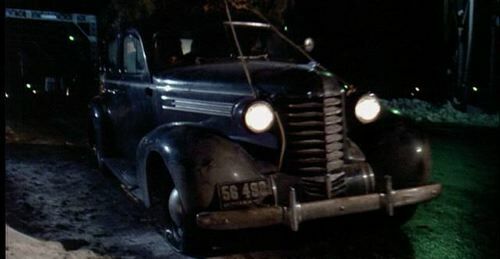 One thing in the narrative that isn’t clear is that the Hot Shot was never offered with the tin block – Crosley had figured out that the sheet metal engine was toast by the time (’49) the Hot Shot was introduced. That final motor was a real thing of beauty: 5 main bearings and an integral head… it was like a little Offenhauser. Sadly, by the time the car had gained a bad reputation, the engines were dialed. In fact, a stock Crosley Hot Shot won the first Sebring 12 hour race (1950), a Crosley competed at Le Mans in ’51 and Crosley-engined cars dominated the H-Modified class in SCCA racing until the early sixties. I’ve been on a Crosley kick for about 15 years now and even spent two years with a ’49 Crosley as my daily driver (actually my only car at the time). I don’t know that I could go back to those days, but it was a really functional little vehicle- as long as I wasn’t in a hurry. There is a really active Crosley Club (http://crosleyautoclub.com/) and parts are amazingly easy to find given the obscurity of the car. And, best of all, they’re still relatively cheap! Thanks again for the nice write up! Anyway, you may notice that I omitted the Farm-O-Road and gave the ‘Shot a little tiny corner of the story. I am still looking for someone in my travels with a F-O-R that would allow pics and such. And I believe that the Hotshot deserves its own story. Any help would be appreciated (hint, hint). Welcome aboard and thanks for the kind words. As a former broadcaster myself, and perhaps I missed the reference but WLW, WGN, WOR and WXYZ were one of the first networks. WLW once went 500KW but complaints from Canada resulted in a cut back on power and directional signal. Someone mentioned the Crosmobile as an export version. From what I’ve read it was mostly exported only in North America….across the two borders. I suspect the conflict was in Canada, much more part of the the Realm in those days. It is said, Powell gave up a trademark logo to Howard Hughes who wanted use of it for TWA…Mr Crosley just gave it to him, not at all how corporations operate today. 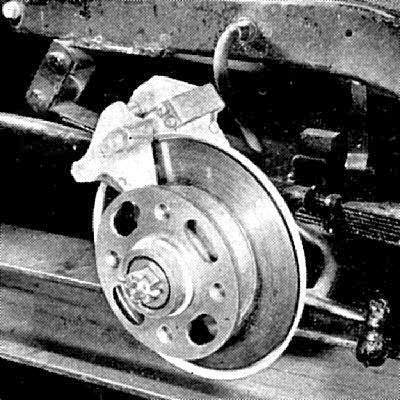 The Hawley Girling disc brakes he incorporated in 1949 for use in his cars were befouled because they were alloy and did not do well on the salty roads of the upper Midwest. Keep in mind disc brakes of the day were for the aero industry where alloy was very common. It actually led to a lawsuit when Crosley reneged on paying for more units later in production. Hydraulic shoes took over in the final years of production. Mr Bakers 1942 model above, has some of the most rare items to be found on a prewar. Due to the war, chrome plating ceased to be used and the hub caps , bumpers and etc were just steel. 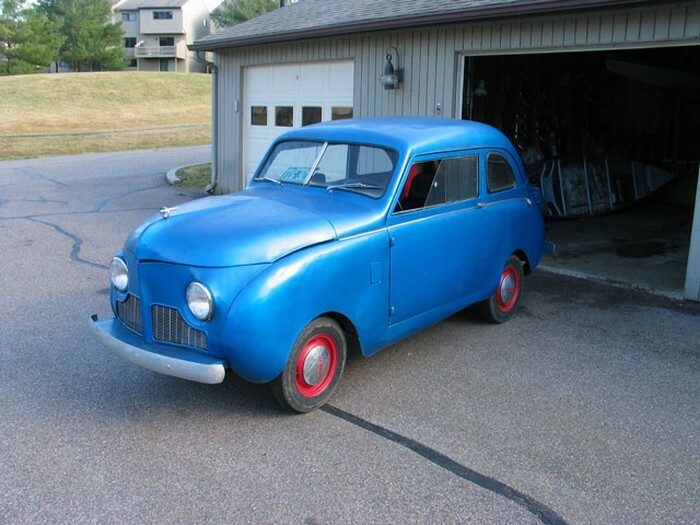 The prototype pictured above called a CRAD (Crosely Radio Automobile Division) is owned by a fellow Iowan just south of me in Burlington Iowa. Mr Paul Gorrell has every model Crosley made and is quite an engineer himself having built a stationary engine made entirely from wood…except the spark plug…. That was a great story and history lesson! But what is also geat is the blue and white wagon is mine!! It belonged to my dad, and it was the first car I ever drove. If you hat e the Crosley or love it, or somewhere inbetween just remember one thing….. I bet you had a smile on your face! Thank you for preserving it so well ! It is an important part of our automotive history. Great article! Some of the facts are a little off but, basically the information is good. As the owner of 10 “Show Ready” Crosleys, The Mrs. & I are very knowledgeable about these cars. We have 2 “Pre-War” Crosleys, and 1 of every “Post-War” body style except 1. If someone wants I can provide pictures. By the way, we are sendinf another Crosley out for restoration in about 2 weeks. It is a “42 Pick-up., One of 4 known to exist, we are told. A well-done report, Jeff; thank you. There are several books on the Crosley saga, and I can recommend the 2008 “Crosley: Two Brothers and a Business Empire That Transformed the Nation” by Rusty McClure, David Stern and Michael A. Banks. (Michael will introduce his new book “Crosley – A Fine Car” in 2012, and advance orders are now being taken.) Crosley’s racing history is also notable. The Crosley Car Owners Club www/CrosleyClub.com of nearly 450 members has a thousand Crosley photos and stories. It’s free and easy to join, and Crosley ownership isn’t necessary. Could you give us a link or an address to pre order ? I’m sure a lots of readers would appreciate your help. Pre-orders for the new paperback “Crosley – A Very Fine Car” by Michael A. Banks are available through Amazon http://www.amazon.com . 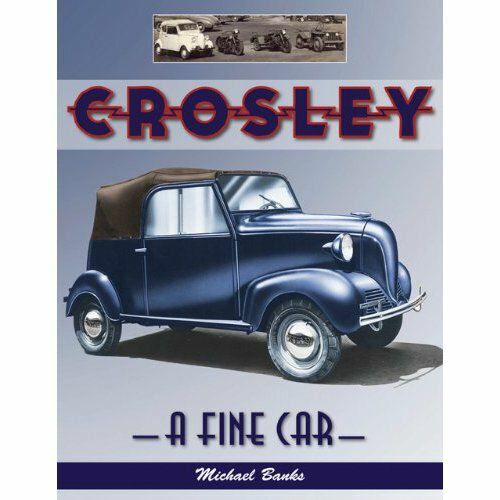 The Amazon description reads “Crosley: A Very Fine Car is an in-depth illustrated history of America’s first compact car, from its beginnings as a rough, back-of-the-napkin sketch in 1937, to its life beyond production and into the 21st Century. The Crosley introduced such revolutionary innovations as disc brakes, the first SUV, a do-it-all farm vehicle, the Cobra engine with its sheet-metal block, surprising styling tricks, retail-store marketing, fuel economy that Detroit still hasn’t equaled. Includes some never before published facts and photos. Good staory. There’s an old yellow Crosley parked in the front yard of the Delta frat house in “National Lampoon’s Animal House”. You can see it later in the film, when Dean Wormer has sent a moving van in to clear out the house. I’ve never seen a Crosley car in the wild, but I’ve seen plenty of their radios and refrigerators. A Northern Ontario resort my family stayed at through the Seventies and Eighties had an old Shelvador behind the counter at its store, still keeping the milk cold. I spent a lot of time playing around with radios when I was a kid, and I kept a log of stations I picked up at night, including a lot of the clear channel stations WLW, WABC, WLS, and WSM mentioned by other readers, and I grew up well within the listening area of CKLW in Windsor, Ontario. Every time I hear an old song from the early to mid ’70’s, I hear “CKLW – The Motor City” in my head. My dad’s old Hallicraft shortwave also picked up AM, and I heard stuff from everywhere on it. I saw it in my mom’s basement a while ago…I’m tempted to grab it sometime and see if it still works. Somehow I missed this article the first time around, glad I read it this time! Made for fascinating reading and an interesting insight into facets of American culture, thank you Jeff! How did I miss this excellent article the first time? Great work, Mr. Nelson! Most folks don’t know that the COBRA engine also had aviation links. Al Mooney used the engine when he rolled out the Money Mite, a single seat airplane. Attracted by the light weight, the low power did not matter so much. However, the engines inability to operate in the wildly varying aviation conditions , especially shock cooling upon descent, had Mooney recalling all the COBRA equipped airplanes and retro-fitting them with a purpose built aviation engine. Mooney Mites are a hoot to fly, even to this day, and echo many of the minimalistic philosophies of Powell Crosley. I bought a Crossley Hotshot from a neighbor for $25 when I was 15 and tore it down for the hell of it. My Dad called the scrap man to haul away the pieces. It saddens me to this dad, but that was in 1968, long before the internet and world wide markets for parts. Saddens me to this day. I’m intrigued by the reference in the World’s Fair ad to ‘Reada – facsimile radio printing’. Even Google doesn’t seem to know much about it. Reada is not facsimile radio printing. Radiofax is radio facsimile printing. You will find all the information you need here. In my early broadcast days, my first exposure to a fax was during a political campaign where one of the aides was making use of one. When I was much younger, the news room at the local newspaper had a similar device to transmit wire photos. WLW, WGN Chicago, WOR Newark, WXYZ Detroit were the founding members of the Quality Network federation in 1929. In 1934, just 2 years from the day the first CRAD (Crosely Radio Automobile Division) Prototype car featured in Jeff’s article made its debut, the stations organized into the Mutual Broadcast System. 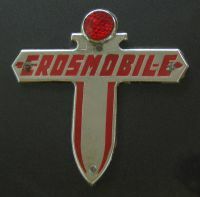 The network grew to include other smaller stations and General Tire took over in 1952, the year Crosley stopped making automobiles. General divested in 1957. The Crosley family estate has been passed to a preservation society of some sort, which will keep the building and grounds intact for many years. The family lot at Spring Grove Cemetery is on a beautiful corner in Section 117…if you want to visit, stop at the cemetery office, they will give you a map. 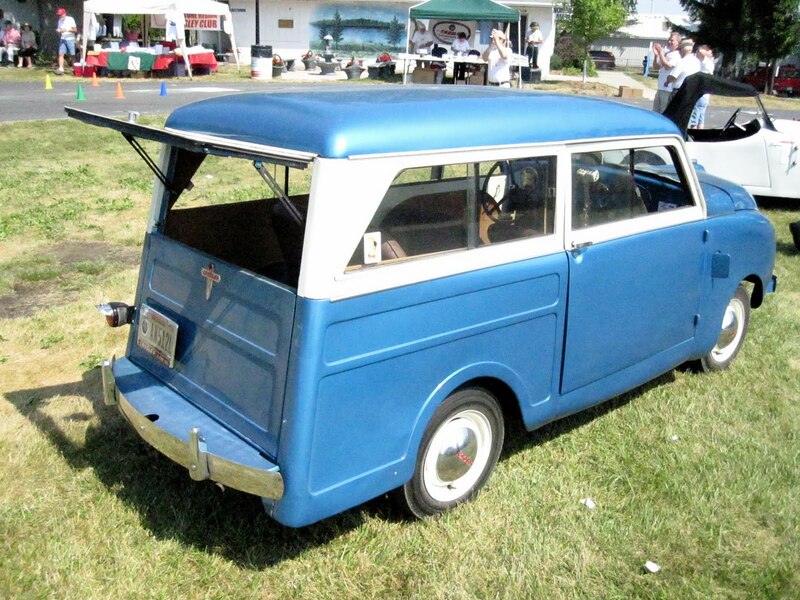 I have a few dim memories of a Crosley station wagon that my family had in the early 1950s. My father later said they made Crosleys for 14 years, which was 14 years too long. I take it he didn’t much like the car. Powell Crosley was a rather amazing guy. He developed a radio that everyone could afford when people had little. He then provided a radio station that was very powerful, and way ahead of it’s time, so America could listen. He then designed and produced a car that everyone could afford. He sold it in department stores, where everybody normally shopped, and had a service station network set up for maintenance and repairs. Sure it was quirky, uncomfortable, and had issues, but it kept many a rail commuter out of the rain, and provided fuel economy that was second to none. 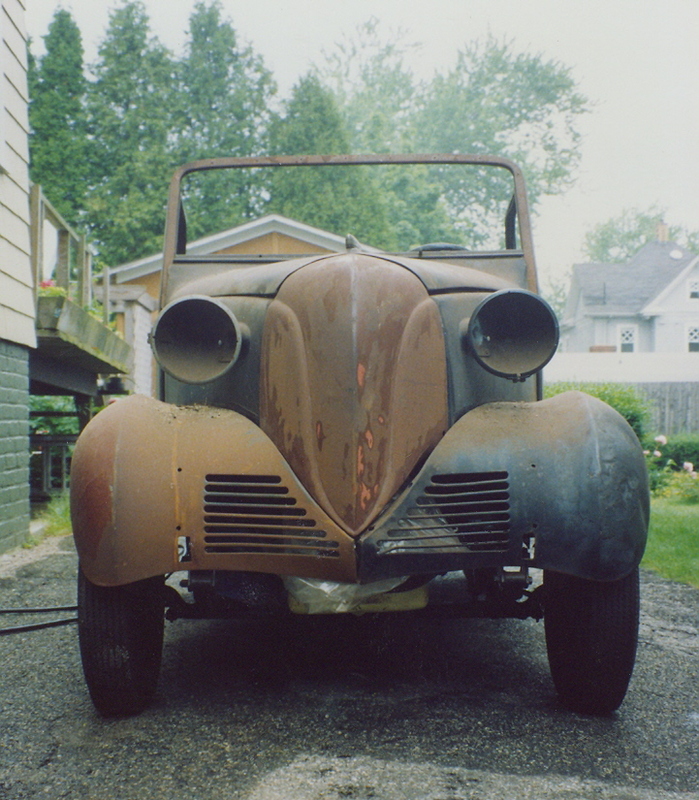 I have a ’42 that I am restoring. I have talked to the original owner, and he can’t wait for a ride! Join the Crosley Club of America, and have some fun for a change!! 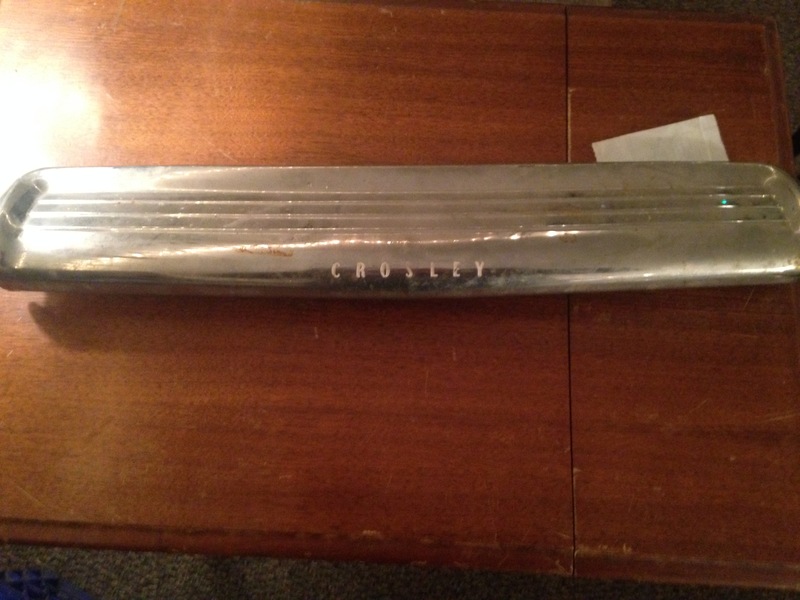 I hope someone is still looking at this because we can’t figure out what this Crosley part or trim this is. Any ideas? Don’t assume it’s from a car. Crosley also made appliances; if I had to guess, it’s from an appliance. We have a 1940s Crosley upright freezer, with a similar styling handle, but vertical. I can’t see the whole thing in your photo, but if it’s symmetrical, I’d guess it’s the handle from a freezer chest. That was a fascinating piece of history. Thank you for sharing with us. I had no idea everything that Crosley was involved in. I love the Crosley refrigerator with the built-in radio. How ahead of time was that? Jeff, this really was a great, well-being researched and written piece. I’m glad that Paul’s end-of-year CC post lead me here.